“During an interview on WMUR-TV’s Sunday morning “Close-Up” program, the governor was asked by host Josh McElveen whether she had ever tried marijuana. I see… well, then, if that makes it all right, Hassan should have no reason to oppose the use of marijuana, provided it is no more potent than that which she used in college. Thanks for your support, Governor! From your article of March 31 (Canadian warship seizes $100M of heroin in ‘massive’ high seas bust), it’s difficult to appreciate how much is involved in making such success stories possible. Consider all the Canadians sailors who have volunteered to serve on HMCS Toronto, and all the taxpayers working and sacrificing to fund the massive expense of such an endeavor. 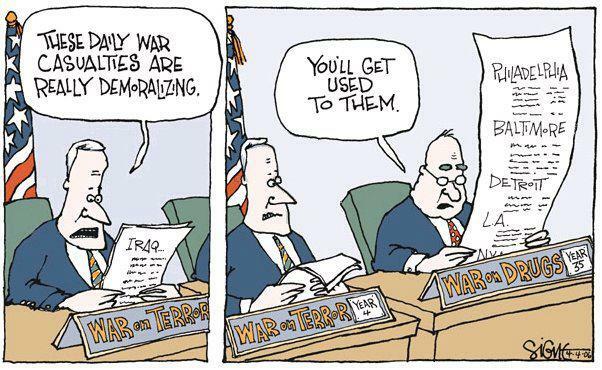 Add in the activists, bureaucrats, and politicians who have laboured long and hard to prosecute the War on Drugs. This sacrifice of manpower and wealth should not go unappreciated, and I thank all participants on behalf of those who will benefit the most, yet cannot speak for themselves – other drug dealers. Having no recourse to all the legal mechanisms available to vendors and consumers of candy, tobacco, alcohol, and other such goods, drug dealers must rely on violence to police each other and to take market share. Surely, no one is happier than they that one of their competitors has been dealt a crippling blow at no expense to themselves. Because Canadians have done the dirty work, remaining dealers are saved the trouble, and, even better for them, can now increase the price of their products in response to the reduction in supply relative to demand. More money for less effort. Let us all bask in the warm glow of our accomplishment. Just to be certain, I looked around a little more, and I found some items that appear to be exceptions, and some that either disprove my suspicion or suggest such regulations are not being monitored. 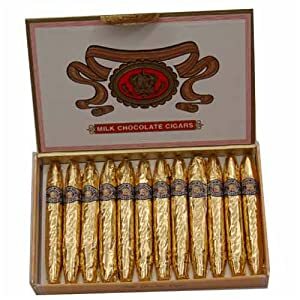 For example, Amazon would not ship one type of bubble-gum cigar, but appeared willing to ship another. 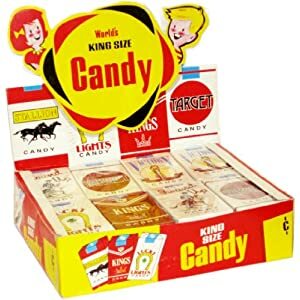 Amazon.ca offers candy cigarettes that appear to violate the regulation cited in Wikipedia. And there exists liquorice cigars that are MADE in Canada. They look familiar, so I presume they are sold here as well. It all gets very confusing, and seems a lot of fuss for very little gain. I suppose the desensitization of children to the abuse of prescription drugs just hasn’t caught nanny’s attention yet. Find the rest here, and avoid falling victim to the state. Repeal Day: Now Twice a Year! “85 years today prohibition of alcohol ended in Ontario. This was a great moment in Ontario’s history and a restoration of our freedoms. I encourage everyone to at some point tonight raise a glass to the freedom to consume alcohol. At the same time you should keep in mind that the legacy of prohibition lives on in Ontario. The LCBO and the Beer Store were both created as a political compromise between prohibitionists and freedom lovers. These monopolistic powers restrict consumer choice and make it difficult for producers to sell their wares. Often Ontario law treats alcohol consumers like idiot children who need a stern lesson, instead of treating them like the responsible adults that they are. So, yes indeed,by all means, raise a glass for the sake of freedom. “Portugal gets it; the president of Guatemala gets it; Now some Canadians are noticing that the whole be-like-the-U.S. and declare war on plants and people is not the best policy idea. I think these physicians are correct in both their diagnosis and their prescription, however, I don’t look to physicians for policy advice anymore than I do movie stars. Of course, every individual is entitled to their opinion, but what am I to make of “International Physicians for the Prevention of Nuclear War“, “Physicians for Social Responsibility“, or “Doctors for the Environment“? Is there something about obtaining an MD that bestows insight and ability concerning public policy? Well, the physicians themselves must think so, because there are an awful lot of ‘Doctors for This’ and ‘Doctors Against That’ in this world. Mind you, Republican presidential candidate Ron Paul is a Ob-Gyn, so maybe there is something to all this. Either way, I welcome all allies. Oh Whitney, you should have never come to Vancouver! “Vancouver health officials will distribute new crack pipes to drug users this fall as part of a pilot project aimed at reducing the transmission of diseases such as hepatitis C.
Well, at least the politicians won’t make a profit from this… in dollars, that is. Those politicians who support this initiative expect to rake in some votes, while those who oppose it while endorsing the War on Drugs also look forward to making a killing. But this is a democracy, and everyone had a chance to cast a vote, so rest assured that prosecuting drug use while enabling drug use represents the will of the majority. Seriously, this is what happens when people try to use government to bring about their personal preferences. If you give politicians the power to spend your money prosecuting drug users, you give them the power to spend your money on free crack pipes. “Expect challenges to a bill signed by Governor Rick Scott which will require welfare applicants to undergo drug testing. To my knowledge, the vast majority of those screened at their place of employment are government employees. If you are paid in taxes, then you are a taxfeeder, not a taxpayer. And since real, private sector taxpayers are seldom screened at their place of employment, we can just dismiss Republican justification for this disgusting bill. If the Republicans are determined to do this, I wish they would at least be consistent about it, but I doubt very much we will soon see board members, executives, and other recipients of corporate welfare peeing into jars any time soon.